There is oh so much to love about Motel Hell, Kevin Connor’s 1980 Horror-satire that is legitimately scary in its own right, while poking fun at the genre it so clearly inhibits and adores. From the terrifyingly hilarious performances from Rory Calhoun and Nancy Parsons to the unsettling and hypnotic score by Lance Rubin, Motel Hell has remains an 80’s Horror classic with a fervent and well-deserved fan following. In Motel Hell, we meet Vincent Smith (Rory Calhoun), proprietor of the Motel Hello (the “o” flickers on the sign), a sick and sadistic man with a dark sense of humor. With help from his equally psychotic toddler-esque sister Ida (Nancy Parsons), the pair set traps for weary travelers on the property surrounding their Motel, bury them up to their necks in dirt, and proceed to cure and process them for Vincent’s famous local “smoked meat”, unbeknownst to those unlucky enough to try it. When Vincent’s next victims lose control of their motorcycle before he even gets a chance to trap them, he’s immediately taken by the beautiful female Terry (Nina Axelrod), and takes her back to the Motel, tricking her by saying that her boyfriend died in the accident, while he’s actually neck-deep in Vincent’s garden. The siblings continue their macabre charade, with the clueless Terry happily staying at the Motel, and their younger brother Bruce (the town Sheriff) completely unaware of their nightly activities. As the inconsistencies start to stack up and Terry and Vincent begin to grow fond of each other, Ida’s jealousy is unleashed and Bruce’s suspicions are confirmed. I hesitate to say too much more about Motel Hell, and allow you to enjoy the film for yourself. 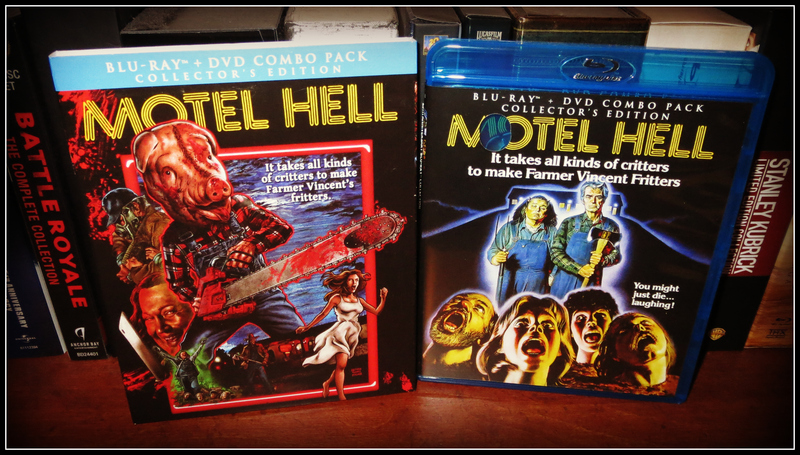 Motel Hell works on many levels, even with shades of Psycho and The Texas Chainsaw Massacre, the film manages to be an original outing strengthened by the fantastic chemistry between Rory Calhoun and Nancy Parsons, and enhanced with fine execution by Director Kevin Connor. Featuring as many scary moments as laugh out loud ridiculousness, it’s the kind of Horror film that you can’t help but feel bad for laughing along with these wacky characters. Scream Factory has brought Motel Hell to the Blu-Ray format with a pleasant and natural transfer featuring bold colors, impressive clarity given the stock, and authentic film grain. It looks great in High Definition, and is a clear improvement over past DVD releases. Detail is solid in most scenes, especially close-up shots (Vincent’s suspenders for example). Any softness that the print exhibits is likely inherent to the original negative. The 2 channel DTS-HD track works very well for the most part, balancing the various elements (dialogue, music, background effects) equally and strongly throughout your home theater. The sound is crisp and clean, with little to no hiccups along the way, and Lance Rubin’s score in particular sounds amazing. I usually don’t mention other reviews in my own reviews (and won’t name call here), but seeing another website critique the amplitude as “anemic” is about as far off as one could imagine. There is no need for subtitles, period. Dialogue/vocals are strong and steady throughout the entire presentation. Well done! Commentary– This audio commentary features Director Kevin Connor, moderated by Dave Parker, and delves into all things Motel Hell. From the initial screenwriting and pre-production to casting choices and tales from the set, this is a very fun listen for fans of the film. It Takes All Kinds: The Making of Motel Hell- This nearly 25 minute documentary is extremely well put together, and features various cast and crew detailing the experience of making the film. The interview subjects are candid and often very funny, providing great insight into both the making of the film and its legacy. I’ve said it before and I’ll say it again, Producer Aine Leicht and the folks at Scream Factory make for a wonderful team! In an age where most companies don’t bother to include special features, or simply recycle older materials, their work is a breath of fresh air for fans and collectors alike. Shooting Old School- Cinematographer Thomas Del Ruth details his involvement in shooting Motel Hell, sharing a little bit of personal history as well as his experience on the set. He’s easy to listen to and provides plenty of worthwhile stories from his career. Ida, Be Thy Name: The Frightful Females of Fear- Running over 18 minutes, this fun featurette features several actresses, commentators, and critics discussing Nancy Parson’s role as Ida Smith in Motel Hell, as well as other important female roles in Horror films (Friday the 13th, Fatal Attraction, Basic Instinct, Misery, etc.). Directed by Calum Waddel, this is another interesting piece that fits well with the movie’s themes. From Glamour to Gore: Rosanne Katon Remembers Motel Hell- This featurette runs over 11 minutes and features Rosanne Katon (Suzy) discussing her experiencing acting in the film. Though she’s barely in the film, Rosanne’s experience getting into the film and how important her career was to her family at the time makes for an interesting watch. Another Head on the Chopping Block: An Interview with Paul Linke- This extended interview runs almost 15 minutes and features Paul Linke, who played Sheriff Bruce Smith in the film, sharing his memories on the making of the film and the importance of his role. Motel Hell Trailer- This rough looking vintage trailer is fun, especially with its gravely voice-over, but definitely makes the film look more terrifying than darkly funny, which must have been a welcome bonus for audiences when they actually saw the film. Behind the Scenes Gallery- About 2 ½ minutes’ worth of behind the scenes photos and production stills, which play automatically. Posters and Production Gallery- A lengthy series of various poster designs and production photos from the marketing campaign for the film, running over 17 minutes. More from Scream Factory- Original Theatrical Trailers for The Funhouse, Terror Train, The Fog, and Without Warning. As you can see from the “Unboxing” pictures below, this Blu-Ray edition from Scream Factory features awesome newly commissioned cover art from Nathan Thomas Milliner featuring Vincent in his Pig head with chainsaw, Ida looking creepy with her butcher knife, the garden of heads, and a great font design meant to resemble the flickering motel sign. It’s important to note that this Blu-Ray set features the original theatrical cover art on the inside slip-sheet, which fans can reverse if they please. On the reverse of the packaging you’ll find a plot synopsis, special features, technical specifications, and select stills from the film. Inside the Blu-Ray case you’ll find the discs (BD & DVD) with some fun artwork to boot. Kevin Connor’s Motel Hell remains a top notch Horror satire, strengthened by the fantastic chemistry between Rory Calhoun and Nancy Parsons. It’s the kind of Horror film that you can’t help but feel guilty for laughing along with these wacky characters. The fervent fan following is well deserved. This Blu-Ray edition from Scream Factory features a strong transfer with natural film grain and bold color reproduction, and audio that nicely balances the clever dialogue and creepy score from Lance Rubin. The wealth of bonus features are incredibly impressive, featuring insightful documentaries and featurettes that fans will adore. This brand new Blu-Ray edition of Motel Hell comes highly recommended. This entry was posted on August 11, 2014 by doctormacabre. It was filed under Blu-Ray Reviews and was tagged with 1980, 80's cult classics, 80's horror movies, blu-ray review, booby traps, butcher, chainsaw, dark comedy, doctor macabre, doctor macabre's laboratory, farmer pig's head, farmer vincent, film fan pete, horror blu-ray reviews, horror comedy, horror movie taglines, ida, it takes all kinds of critters to make farmer vincent's fritters, kevin connor, lance rubin, meat market, midnite movies, motel hell, motel hello, my horror blu-ray collection, nancy parsons, nina axelrod, paul linke, pete macabre, psycho, rory calhoun, rural psycho movies, scream factory, secret garden, the texas chainsaw massacre, thomas del ruth, top ten scream factory releases, vincent smith, wolfman jack, women in horror.